Amatrol’s DC Drive with SCR Speed Control Learning System (85-MT5F) adds to Electronic Motor Control (85-MT5) to teach variable speed motor control of DC electric motors using Silicon Controlled Rectifier (SCR)-based circuits. SCRs convert AC voltage into a DC voltage in order to provide efficient variable speed control of DC motors and are widely used within industrial applications such as cranes and machine tool spindles. 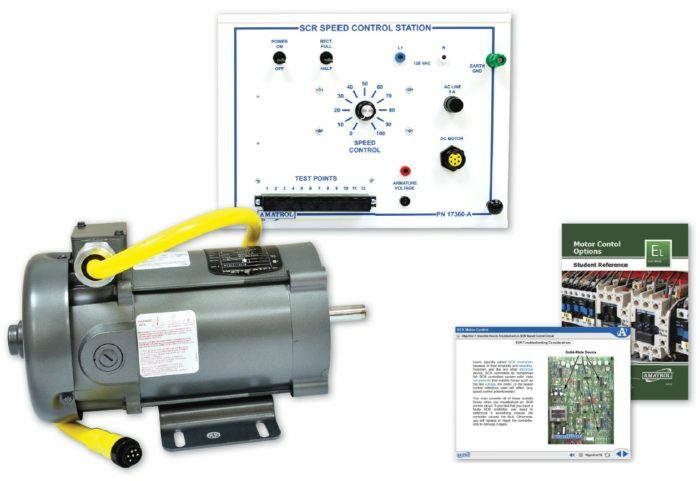 The variable speed motor control training system features heavy-duty components like an SCR speed control unit, DC shunt wound motor, and fuse block to give learners real-world practice on SCR speed control skills such as connecting and operating a motor with SCR half-wave speed control, measuring the performance of SCR half-wave speed control, and troubleshooting an SCR speed control circuit. These hands-on skills are carefully interwoven with world-class SCR speed control curriculum so that learners understand both the theoretical and practical knowledge that they’ll need to be successful. Amatrol’s variable speed motor control training system is built with components that are both heavy-duty to stand up to frequent use and industry-standard so that learners can gain real-world experience. The variable speed control training system includes a ¼ HP DC shunt wound motor, a slide-in, pre-wired, 11-gauge steel panel with an SCR speed control unit, speed control adjustment, fuse block, and full/half wave rectification switch. The SCE speed control unit provides adjustable current limit with LED indicator, IR voltage compensation to provide 1% speed regulation throughout 60:1 speed range, minimum and maximum speed settings, and adjustable linear acceleration and deceleration times. Amatrol uses the strength of the variable speed control course’s curriculum and directly applies it to practicing hands-on skills so that learners can gain real-world competencies. As an example, learners will connect and operate a DC shunt wound motor with both SCR half-wave and full-wave speed control and measure their performances. The variable speed control course also features fault troubleshooting so that learners can troubleshoot an SCR speed control circuit. Amatrol’s world-class DC drive with SCR speed control curriculum provides learners with strong foundational knowledge on how to operate, install, analyze performance, and troubleshoot SCRs for various applications. Learners will study the functions and applications of SCRs, SCR half-wave speed control, and SCR full-wave speed control. The SCR speed control course’s curriculum is presented in an interactive multimedia format. This multimedia combines text, audio, 3D graphics, and interactions to fully engage learners and support all learning styles. A sample copy of the Motor Control Options Student Reference Guide is also included with the system for your evaluation. Sourced from the system’s multimedia curriculum, the Student Reference Guide takes the entire series’ technical content contained in the learning objectives and combines them into one perfect-bound book. Student Reference Guides supplement this course by providing a condensed, inexpensive reference tool that learners will find invaluable once they finish their training making it the perfect course takeaway.